En busca de cintas sobre asuntos mexicanos en la base de datos de la American Film Company, popularmente conocida como Flying A me encontré con la película The Mexican dirigida por Allan Dwan, quien fuera un legendario director activo hasta la década de 1960. También fue Dwan el responsable del argumento. Este es uno de sus primeros trabajos; aún no emigraba con Griffith para ser el responsable de la toma con grúa y dolly que aparece en Intolerancia (Griffith, 1916). A él debemos Sands of Iwo Jima (1949) y Escape to Burma (1955) por mencionar un par de sus filmes más conocidos. En México visto por el cine extranjero, Emilio García Riera menciona el filme The Mexican producido por la Selig en 1914. La estrella de este western de un rollo fue Tom Mix, pero no hay mención alguna de la producida por la Flying A. 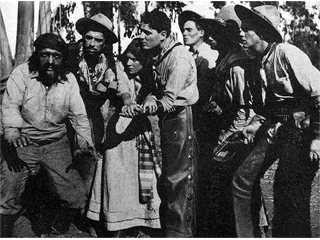 The Mexican (USA, 1911). Productor: American Film Company. Distribuidor: Motion Picture Distribution & Sales Company. Rollos: 1. Marca: Flying A. Género: Western romántico. Director: Allan Dwan. Argumento: Allan Dwan. Intérpretes: Jack Kerrigan (Clarence Stowell), Pauline Bush (Dolores), Jack Richardson (Charlie Mason) y George Periolat (Joe Curvey, el mexicano). Es posible que en 1917 se hubiese vuelto a distribuir con el nuevo título de Mexican Intrigue. Joe Curvey, a Mexican, finds a baby girl in a basket on his ranch. He adopts her. Eighteen years later, a bitter race animosity against the Mexicans prompts Charlie Mason, leader of a gang of cowboys to assault Curvey, when he calls at the local store for supplies. Thinking that they would not molest Dolores, his adopted daughter, sends her on his next errand. A female makes no difference, and the toughs bombard the Mexican’s hut. Dolores manages to escape, but quickly returns with Clarence Stowell, and his fellows, who immediately disperse the invaders. Dolores and Clarence fall in love. The Mexican, rankling under the many injustices, calls his friends together, and there is a lively battle between rangers, cowpunchers, and Mexicans. The Mexican and his daughter are capture, but are soon released by the timely appearance of Clarence Stowell.